The Chevrolet team is down in Austin, Texas this week for the South by Southwest (SXSW) technology and arts festival. 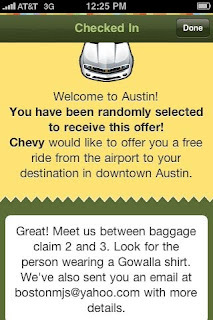 As part of Chevy’s marketing effort, they teamed up with location-based service company Gowalla (a competitor to the better known Foursquare) to create a nicely done driver service for those checking into the Austin Bergstrom Airport. Basically, when one checks into the airport’s location on the Gowalla application some people are randomly served up a free ride from the airport to downtown Austin in a Chevy vehicle of course. I really like the online, offline integration here. It definitely provides Chevy with some positive brand lift for the well-connected people attending the SXSW festival. It's a nice way to reach a socially active audience that is sure to Tweet, blog or even talk in person about what a cool thing Chevy and Gowalla did on their trip. For one blogger’s personal experience with the Chevy Gowalla offer checkout this post from the blog DigitalBeforeDigital. I have always had such a great experience at any Chevy service center that I've been too. Their location and services make it convenient for me to just take my cars there as opposed to independent service stations. This is one of the reasons why I am such a loyal customer.